VA loans are commonly used by veterans to buy their first homes. However, veterans who have previously used a VA loan may be able to use any remaining entitlement on a second home. The recent collapse in the housing market has made it more difficult for some active adults to secure the loans they need to buy their retirement homes. Even when loans are approved, the process may be longer and more involved than it once was. Fortunately for veterans, using a VA loan can be a great way to cut through some of the red tape and walk away with a comfortable repayment schedule. 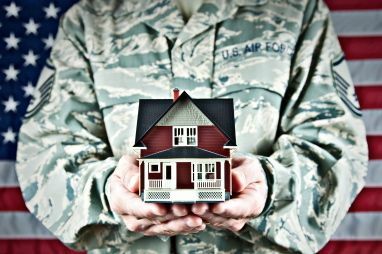 There are many options for financing a home purchase, but the VA loan program offers military veterans several attractive benefits. In most cases, no down payment is required. VA loans also give homebuyers more flexibility in negotiating interest rates, require no mortgage insurance premiums, and put a limitation on the buyer’s closing costs. Homebuyers can choose a VA loan with a repayment schedule that works best for their current situation. In addition to traditional fixed 30-year loans, the VA loan program offers other repayment structures which may be more appropriate for retirees. These include Graduated Payment Mortgages (GPMs), Growing Equity Mortgages (GEMs), traditional Adjustable Rate Mortgages (ARMs), and hybrid ARMs. Veterans with active duty service during or after World War II who were not dishonorably discharged may be eligible for VA loans. Specific eligibility requirements vary depending on whether the time in service was during wartime or peacetime, and on the conditions of the discharge if it was less than honorable. Surviving spouses may be eligible, if they have not remarried. Members of the Selected Reserve, such as the National Guard, may also be eligible if they served a minimum of six years and were honorably discharged or are still serving. VA loans are commonly used by veterans to buy their first homes. However, veterans who have previously used a VA loan may be able to use any remaining entitlement on a second home. Their previously used entitlement can also be restored, allowing them to use a VA loan to buy another home. Their entitlement is restored when the original property is sold and the loan is paid in full or if a qualified veteran-transferee is able to assume the VA loan when buying the home. While VA loans are commonly used to purchase homes, they can also be used to refinance a home, or make certain home improvements as well. Adding energy-efficient elements such as solar panels, heating and cooling systems, water heaters, weather stripping, and storm windows or doors may be allowable if the improvements are approved by both the lender and the VA. Begin by applying for a Certificate of Eligibility (COE) either online or by submitting VA Form 26-1800, Request for a Certificate of Eligibility, to the VA’s Eligibility Center. Lenders can often help buyers with this process. Choose a home to buy or build, negotiate the terms and sign a purchase agreement. Have the lender request an appraisal from the VA through The Appraisal System (TAS), which is an online service available to lenders. Buyers can apply to the lender for the loan while waiting for the VA appraisal to be completed. Final approval of the loan will be made after receiving the completed appraisal. Once the appraisal and loan have been approved, buyers can close on the loan and move into their new home. In the wake of a disastrous housing market, veterans with VA loans appear to have fared well. According to reports by the Mortgage Bankers Association, delinquency and foreclosure rates remain relatively low for VA loans when compared to other common loan types. For many eligible veterans, VA loans may be the best way to afford their retirement dream homes. For more information, speak to your local VA office or visit the VA online.